Kennedy May Willey suffered her first seizure as a child shortly after receiving the DTaP vaccine. 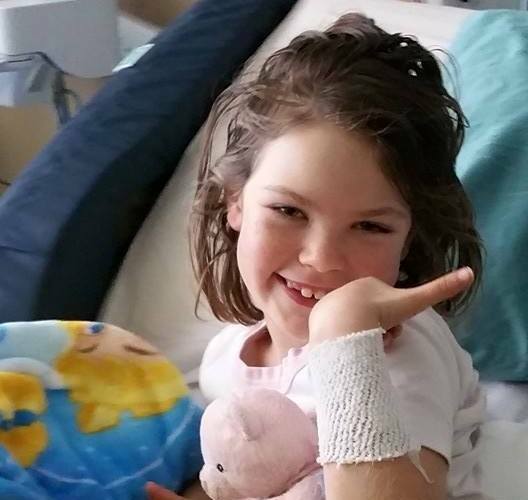 Today she is a 7 year-old girl diagnosed with Dravet syndrome who has led a very active and "normal" life. They attribute much of their success to the GAPS diet. When her seizures recently increased, her parents found themselves in a hospital with what they believe was an over-zealous doctor that wanted to try a drug cocktail of treatments. Seeing her condition quickly deteriorate, they sought to transfer her to another facility. They were threatened with losing their daughter to CPS, so they hired attorneys to help them get her daughter transferred. The Willeys want to share their story with others as a warning to the dangers of medical kidnapping that so many other parents are facing today. Have we now come to the point in the United States that in order to get one's child transferred to another hospital or seek different treatment options that one needs to hire attorneys to do so? What about those who cannot afford attorneys? Hello, I'm looking for an update on Kennedy. I used to follow their Facebook group but see it has been blocked or removed. Perhaps someone close to the family would consider a petition at Change.org or a similar site. Maybe that would get the attention of COCH. If everyone files a complaint against this doctor at the state and licensing level, also on yelp, that will help, I WANT TO WARN YOU ALL THAT THE REGIONAL CENTERS AND SCHOOL DISTRICTS WILL ALSO USE CPS AND FALSE POLICE REPORTING TO GAIN CONTROL OF PARENTS. LOMA LINDA UNIVERSITY AND UCLA HAVE BEEN GOOD FOR US,, CHOC, we had dr fowler who we really liked as he really went the extra mile and when he couldn't stop my sons seizures he sent us to loma linda. You have the right to refuse this doctor. you need to file medical malpractice lawsuit on this doctor,, sue the ***. . Ive been doing this for 27 years. Been from OC to SBD and now riverside, Had more cps visits than i can count and it has been a ugly 15+ years as i have fought for every little thing., and been retaliated on and intimidated every step of the way,, Doing it now with the inland regional center.... But i thank god APS and the court investigator saw the truth and knew about the disability laws from what i can see, You all can join my " inland regional center (from a clients perspective) "Face book Group if you would like as at one point the regional centers will get under your skin as well,. wether your OC or any other county , your welcome to join the Inland Regional center group as it is a place where you can say what you want as we all want change in the way the system currently has no accountability and our government has no right controlling our children like that, We will stand together for change with all children, not just our own. Hugs to everyone and if anything, DONT EVER BACK DOWN AND KEEP SPEAKING OUT FOR THE RIGHTS OF OUR CHILDREN AND THE ACCOUNTABILITY OF THOSE WHO DO WRONG. My child is going through the similar situation. Dr. Zupunc and her puppet, Dr. Andrew Mower enlisted Social Services Agency (known as SSA or CPS) to kidnap my daughter recently and forced medications (overdosed with Depakote), and she was in a coma state due to the medications. Fortunately, we got contacted with UCLA neurology team and transferred her out of CHOC (Children's Hospital in Orange County). At UCLA, they tapered off Depakote due to the side-effects my daughter was experiencing. They put her with new medication but it also didn't help to control my daughter's seizures. All medications are tapered off now, and we are trying Ketogenic diet which is working great. But I am still going to custody court at Orange County, and it has been more than 4 months, unable to focus with my work. It was completely unnecessary for Dr. Mower to call SSA, but he reported to SSA that my daughter is at risk of passing away without medication. But oddly the medications were making my daughter's seizures worse on top of all the side-effects that she suffered. My daughter's seizure is intractable epilepsy and there are about one third of the seizure patients suffers from this seizure disorder that is not curable. The medical doctors always favor keep trying different types of medications that are out there that has no warranty of better control of seizures. Often times, these medications can do more damage than help, especially for the younger ones, which my daughter was the case. She was diagnosed with seizure when she was seizure when she was about 8 months old, and has been on 5 different types of medications in her 4 years (Topomax, Zonogram, Keppra, Sabril, and combination of different meds). Her seizures continue to get worse and worse, and she was taking over 3,000 mg per day, but still she was having seizures 50-100 times per day, and couldn't walk and drowsy, suffering from a significant intellectual delay. We found a world-renown acupuncture doctor located in Torrance, CA, (Y.K. Chung) and through his treatment, my daughter's seizures were controlled far better with no medications, and her development followed in a number of ways. Her seizures are not completely cured, but she was much better without medications. We went to CHOC just for EEG check up, and that's where everything happened. Dr. Mower falsified the discharge paper, and called Social Services Agency. Within a week, my daughter was taken away from her home with police, para-med, and Social Service Case worker. And they took her back to CHOC and started to give Depakote more than 900 mg one day, and she was having far more seizures than at home. It was like a hell as parents watching our daughter suffering from the medication that were harming her, yet couldn't do anything because she was under a Court order. There were many things I can't explain on this short response that were unfair and oppressive by SSA and Doctors, and now at the Court. At CHOC they fabricated medical documents showing less dosage and also stated that her seizure got improved 50%, but she was at coma state, couldn't wake up, if they call that controlled. My daughter suffered from the side effects from the medications, and couldn't go back to her school for 3 months, and couldn't continue her therapy at home. When someone like doctors that we need and have to depend on for their absolute honesty and integrity happen to be crooks who can challenge them? If they are bent for evil, who can ask for justice? But I believe truth will prevail, and truth will shine forth. I hope that CHOC can clean up some trash in their Neurology department to restore their good name in our neighborhood. I am definitely not going to CHOC again, and will encourage other parents as well until Dr. Zupunc and her staff she brought on board are gone. I don't feel safe to send my child in the care of doctors who is manipulative and do harms to their patients. My daughter's custody attorney is planning to call Dr. Mower to the court as a witness, and it will be fun to see how coward he is, and let the truth be exposed. It's funny that he mentioned that he could lose his license several times when I was dischared from CHOC, and this incident might be his self-fulfilling prophesy for him. Who knew a check up could turn into a nightmare that still goes on for month after month. Our entire family is suffering from this incident. And I surely hope that no more innocent victim from this type of aggressive pattern from doctors. I don't know and have not heard even from different countries that doctors can call Social Services Agency (CPS) to kidnap the children legally, and force medications without the parents consent to a child who is non-communicative? For those who were fortunate enough to control the seizures with first trial of medication, good for you, but there are about one third of the epilepsy patients whose conditions are intractable. Multiple medications, new medications, cocktails of medications are common among those patients with no warrant of successful treatment, which accompanied by other serious side-effects such as kidney, liver, pancreas damage, and intellectual delays. I hope one day a real treatment can come for this dreadful sickness, and I surely hope and pray that no one suffer from it. Heidi said: > I think it is important to remember, here, that Dr. Zupanc has done so much good in her career. My respect for her and her team is immense. I do not know the full story and so it is not my place to judge. I do, however, know from personal experience that the well-being of my daughter has always been first and foremost in the mind of Dr. Zupanc. Due to this fact, my daughter is now seizure free. I couldn't be more proud that Dr. Zupanc is my daughter's epileptoloist. I agree with Heidi - Dr. Mary Zupanc was our 'miracle' I too sympathize with Kennedy and her family and believe every situation is unique and hope that Kennedy continues to do well. My son Emmett suffered thousands of seizures before the age of 3, he suffered from Doose Syndrome. We tried 9 different drugs and the ketogenic diet, and after going to 3 different specialists we packed our bags and traveled over a 100 miles to see an expert, Dr Mary Zupanc - which I believe wholeheartedly. We knew the medicine she recommended was a risk but also knew with the quality of life our son had endured was a risk worth taking. We did our research and took that risk. Emmett became seizure free two weeks later and remains so today. He became med free in 2012, after 5 yrs on the med Dr. Zupanc originally prescribed. We are indebted to Zupanc and her team and know of many many other families that she helped become seizure free. Doctors are human too. As a parent you know best and I commend you for trusting your gut....we all need to as advocates for our children. But in Zupanc's defense she is ALL STAR in our book and I will continue to recommend her to any child I know that is suffering from a similar situation like our son Emmett. This story make me so sad, cps will do anything just to earn an extra buck. These parents are anyway going through so much they definitely don't need this added to their plate. cps needs to back off and give these people and this child the much needed rights to another opinion and if their going to get better help else where what's the big deal-io. I hate people sticken their noses where it doesn't belong. Reminds me of the poor 6 month old baby girl who died in cps care because she was forced from her home to live with foster parents who abused her till her little brain could no longer fight the swelling and passed on. The people don't care who they hurt as long as they get a fat pay check. Fight for the kids who really need their help not these sad storirs we always hear about. GRRRR, makes me so angry. Best of luck to this family my thoughts and prayers are with you. Very well said, sums it up perfectly! We all need to band together and take control of our kids and nation back! My family has been so hurt by CPS. Dr. Mary Supanc, or should I call her Mr. Mary Supanc as here fellow students called her in med school during her fellowship at UCLA did even worse to me when I attempted to transfer my son, Jacob Shiel Simon to be cared for my friend, a triple board certified neurosurgeon. Well, to make a long story short, after 18+ months in Juvenile Court, my ex-husband, who is not even the birth father but named the "presumed" father received 100% physical custody because I physically could no longer endure the battle. Dr. Victor Frankel said, "An abnormal response to an abnormal situation is normal." I will do ANYTHING to help ANYONE expose Mary. She is evil incarnate. My son Jakey spent the beginning of his epilepsy journey with CHOC and medical doctors associated with Mr. Mary. When they found out he also had schizencephaly, they flippantly told me, a single mother, your son cannot have kids. I was devastated. I Have been through a similar situation at a hospital here in Maryland. I was trying to get help for my daughter who had recently burned herself on her legs with s flat iron. My daughter had a spinal stroke three years ago and since then has no feeling in her legs. Burning them did not hurt her and she did it twenty times the first time and four times the second time. My husband and I did not know she had done this until way after the fact. So when I took her to get psychiatric treatment, I ended up getting a CPS claim that I neglected my children. She was denied care at the hospital and after she said, " I will hurt myself if you send me home." They sent her home. After a few anxious days, we finally had her admitted to another hospital who was willing to help . The second hospital helped clear us of the unfounded charges. My question is who hold hospitals response when they neglect children? You must mean "narcissistic": They think that they are right and their opinions and work are superior regardless of evidence. Max - you must be thinking of another adjective, as introverts are none of the things you accuse them of. Introversion or extraversion merely has to do with how you derive your energy: if you are energized by being around people - Extravert; if you are revived by spending time alone (or even with a close friend or two) - Introvert. How much money did you recieve for backing up this so called Dr. Who should have been stripped of her medical license to PRACTICE her WITCCRAFT! It is those like this one who give ALL a very bad name! The big issues here are : 1. Doctors with big egos, who only have pharmaceutical training and are not trained to think in terms of common sense or old- fashioned intuition or any natural substances as treatments. 2. Too much authority given to any single Dr or Hospital. 3. Hospitals and the Drs that work in them ARE A CAPITALIST BUSINESS FIRST - they have to make money. 4. Doctors are human beings who want to be thought of as 'experts' and are always looking to make themselves famous for their 'cures' - they want to be in the history books, and any human in front of them is in their eyes just a 'case', to be treated. 5. Many, many people are now questioning what they do, which is causing many of them to get very upset with anyone who doesn't just let them do whatever they want, without question. All the above gets added on top of this and we now have a very problematic state of affairs. Dr's are no longer GODS in the public's eyes ! I think it is important to remember, here, that Dr. Zupanc has done so much good in her career. My respect for her and her team is immense. I do not know the full story and so it is not my place to judge. I do, however, know from personal experience that the well-being of my daughter has always been first and foremost in the mind of Dr. Zupanc. Due to this fact, my daughter is now seizure free. I couldn't be more proud that Dr. Zupanc is my daughter's epileptoloist. I brought my 2 week old infant to this hospital because she had been cranky and crying a lot. I was a first time mom, breastfeeding. The doctors immediately insisted on doing a SPINAL TAP on my infant. I reluctantly permitted it because the physician told me she might die if he didn't do this procedure. My infant screamed in pain like I have never heard a baby cry. it turned out she had a simple case of oral thrush.